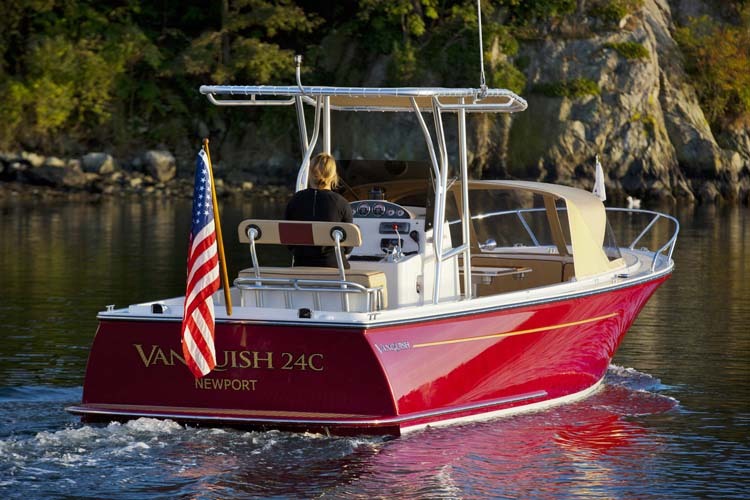 The 2015 Vanquish 24 Runabout is a modern boat, in a classic package. 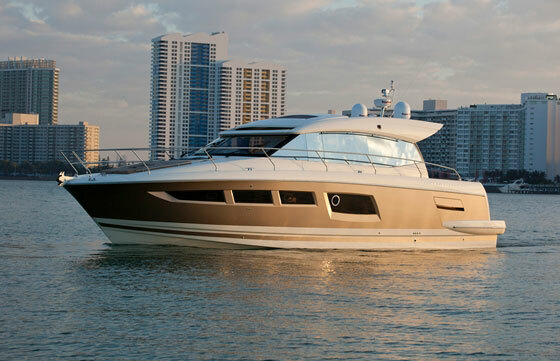 The Vanquish 24 Runabout looks like a classic boat, both above and below the waterline. It has the tumblehome, it has the enclosed bow, and perhaps most surprisingly, it has the motorbox in the center of the deck. Yes, a motorbox—this is a straight inboard boat, which you don’t see too often these days. So in an odd sort of way, stepping aboard the Vanquish 24 Runabout was almost like flashing back to the old days when there was more wood than fiberglass afloat. Then, I actually tested the boat. And it’s nothing like the clunky, ancient-feeling, hard-to-handle straight inboard. 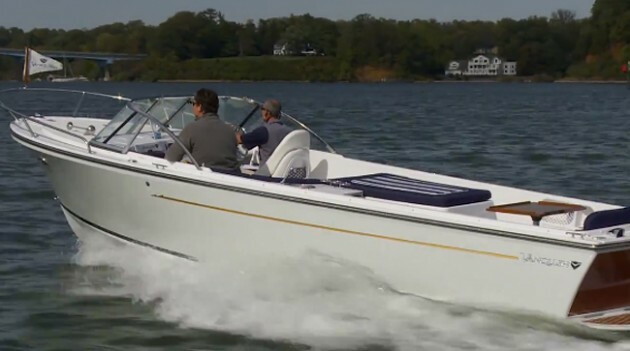 Come along for the ride in this video boat review, and you’ll see exactly what I mean. 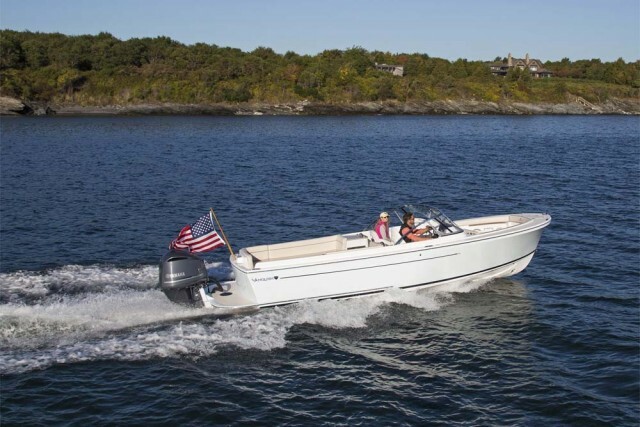 Build a boat with classic appeal and a straight-inboard powerplant, but also with the most modern construction techniques—plus performance that matches today’s boats. -Major sections of the boat are vacuum-infused. This technique provides the optimal resin-to-glass ratio, maximizing strength while minimizing weight. -There’s carbon fiber in the stringer grid, to enhance strength. -The hull-to-deck joint is a case-study in how to do it right: it’s secured with screws run through the rubrail, through-bolted for extra security, and sealed all the way around with 3M 5200 Adhesive/Sealant. -Top-shelf Armorflex buff-back gelcoat is used on the exterior. -Through-hull fittings below the waterline are silicon bronze, and those above the waterline are stainless-steel. -With a 375 HP, 6.0L Crusader straight inboard, performance was surprisingly spiffy: cruising speeds in the low 30 MPH range, and a top-end just shy of 40 MPH. -There’s plenty of low-end grunt for pulling water skiers and water toys. -Thanks to the prop pocket, draft is a surprisingly low 1’10” and shaft angle is significantly reduced. -Oversized rudder makes for tight turns and quick responses at the helm. -Inboard power provides a low center of gravity, improving the boat’s wave-splitting ability and reducing roll. -Variable-degree deadrise hull rides well for its size. We got bounced around a bit on test day but that was no surprise, considering the rough conditions. All in all, the boat handled it well. -The length-to-beam ratio is relatively low, with a beam of just 8’0” (and a LOA of 25’8”). This improves stability and seakeeping, though it does also reduce room inside the boat; it seems a bit narrow inside. -The motorbox, which rises on an electric lifter at the press of a button, makes for a great sunpad and converts into a lounge. -The motorbox also eats into deck space. 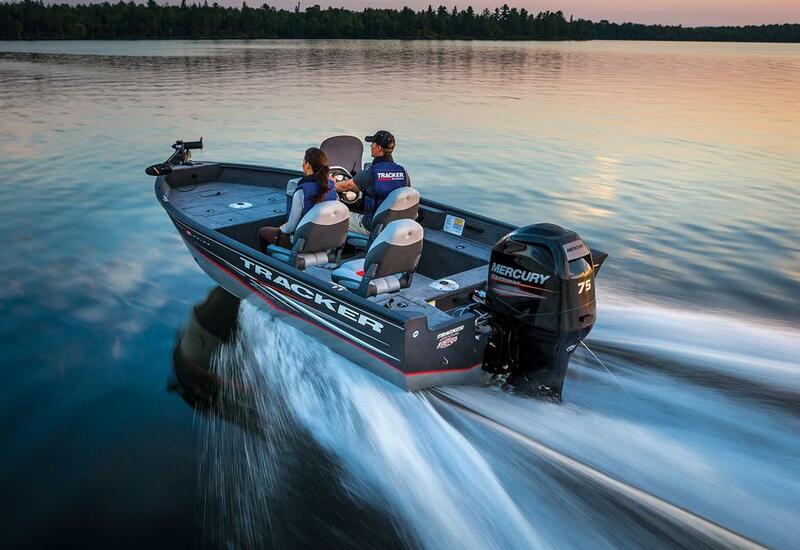 -Did we mention that this is a new 2015 model boat… with a straight inboard powerplant? 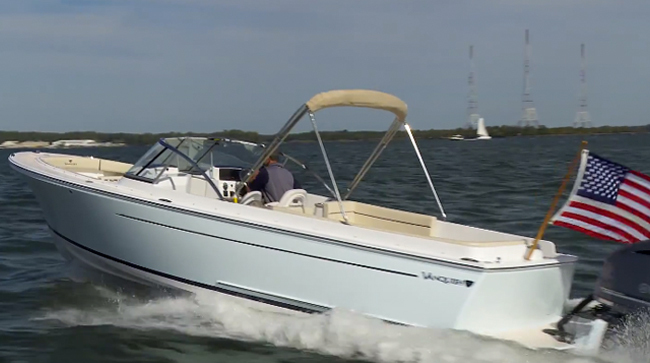 Watch the video boat review of the Vanquish 24 Center Console or read the full review of that boat, Vanquish 24 CC: A Boat With Blue Blood. Interested in buying a Vanquish 24 Runabout of your own? 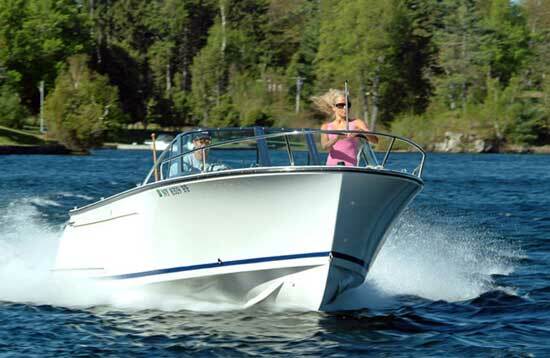 See these Vanquish 24 Runabout listings, or visit Vanquish Boats.